The Techstars Health Accelerator recently set up shop in Los Angeles with Cedars- Sinai—the second, Techstars powered startup accelerator in the city--in a move to help healthcare startups get to market quicker. We caught up with Omkar Kulkarni, Director of the new accelerator, to hear more about what the accelerator is looking for, and how it hopes to help promising startups. The accelerator's deadline is Friday. Thanks for the time today. For those who aren't familiar with what you're doing, give us a high level overview of the Techstars/Cedars Sinai Health Accelerator? Omkar Kulkarni: The program is a three month, residential program here in Los Angeles, which is physically located at Cedars Sinai. The idea is to have a partnership between Cedars-Sinai and Techstars, where we select ten healthcare startup companies focused on innovative technology and care delivery in healthcare. We're focused on way to support and accelerate the pace of innovation at those companies, through robust mentorship, both from the Techstars community and Cedars-Sinai community. The real unique part of this program, which I'm excited about, is the marriage between the mentoring that a company could receive from both those with an entrepreneurial startup background of Techstars, and the deep, vertical knowledge of clinicians or healthcare administrators, who have been doing healthcare work for a while. Both sets of mentors re really united to help drive the pace of growth of these startups, must faster than they might have grown traditionally. Omkar Kulkarni: The program starts March 28th through June 23rd. You mentioned a little bit about the mentoring, what what other benefits would companies get from becoming part of an accelerator? Omkar Kulkarni: Accelerators, particularly those that are run the way Techstars is, are great for companies, because they offer opportunities for close interaction with mentors and leaders in the industry. It's hard to get that kind of rapid feedback, guidance, coaching, and mentoring in such a short period of time elsewhere. We're able to accomplish in three months what traditionally would have taken 12 months, because we've squeezed the pace of growth into a short period of time, and focused on getting the right people in the room to provide mentoring and coaching from point A to point B. A couple of big factors that I think are helpful, is the network it opens up. Cedars Sinai has a wide range of networks, from providers, payers, and other key stakeholders, and Techstars has a wide network of investors, entrepreneurs, and leaders in the startup space, and being able to connect those people creates and amazing opportunity. It's often tough to get certain meetings with some of these people outside an accelerator. Suddenly, you're surrounded by those people on a daily basis. Are there specific kinds of startups you are looking for? Omkar Kulkarni: We're deliberately casting a wide net. We want to make sure we are incorporating every kind of disruptive or innovative company that exists in healthcare. Those might be in categories that may not exist today. We love to work with companies who are pushing the envelope, and creating new innovation. What we're seeing, in some companies who have expressed interest so far, is work related to consumer facing applications—focused on patient or family engagement in healthcare; lots of connected device companies; healthcare Internet-of-Things, where the devices are a patient's smartphone or other forms of technology, and which are aimed at providing patients and providers with information to help in healthcare decision making. We've seen some interesting, disruptive models with marketplaces, which challenge the traditional way that healthcare is delivered. Finally, we're seeing some really interesting research in biotech applications, and ways to drive innovation in healthcare research. What stage should those startups be at--do they need to have customers or funding, or just an idea? 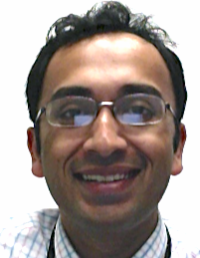 Omkar Kulkarni: Good question. The program is an accelerator, but not necessarily an incubator. We'd like to see the companies have a product or service, and have a founding team, dedicated full time to their product or service. We're looking for companies, not ideas, and having said that, we expect to see a wide range of stages of those companies, from those with only a seed round of funding, to those with an open Series A, or even have a Series A closed. In terms of round of funding and how far along, we have a nice bell shaped curve, with some who have raised significant aounts of capital, to some just raising their seed round. The key distinction, is they have to have full time founders, who are focused on this, and are companies with a product already developed or in their final stages, and not just entrepreneurs looking at an idea. Finally, what's the next milestone for the accelerator? Omkar Kulkarni: Our next milestone is the application deadline, which is this Friday. Applications are due by the end of the day Friday, January 8th. Companies will be evaluated in January and February, and the program will launch on March 28th, with the Demo Day on June 23rd.